Then there’s the Rainbow/Ruby plot. Jenifer Lewis is an absolute delight, and having her (and Laurence Fishburne) in this season on a more consistent basis is only a positive for the show. If there is a “problem,” however, it’s how her “black (grand)mother knows best” routine can sometimes go too far into the left field, which is the case here. Lewis can make any line hilarious; that’s not the problem. But when you have her asking questions like “Since when is Thursday a school day” and just straight up giving the kids ice cream for breakfast, her feud with Bow becomes too lop-sided on Bow’s side, with Ruby just being wrong constantly. The idea of a grandma spoiling her grandkids isn’t inherently bad, but it borders on oblivious here, especially when you compare Ruby’s grandparent role to Pops, who is at least sometimes right. Speaking of Pops, even in the shakier episodes of the first season, Laurence Fishburne was always an effortless highlight of the series. In a world where Hannibal is no more (I’m sorry), the best thing to come from that loss is the increase of Fishburne’s role in Black-ish. Whether he’s lounging about, getting drunk, or rocking a flashback ‘fro, Pops is always entertaining. In an earnest way, Fishburne is the Poochie of Black-ish: Whenever Pops is not on screen, all the other characters should be asking “Where’s Pops?” In addition to everything else, Black-ish is very much about Pops and Dre’s relationship; it’s a show about the generational gaps from father to son (and the same is true with regards to Dre and Junior). And despite Dre blowing everything out of proportion to the point of singing Luther Vandross and freaking out when a balloon pops, the episode is actually a pretty great, subtle examination of that idea. It feels strange to call an episode where Dre is at his most over-the-top Dre status a subtle, understated episode, but that’s really what it is. There’s no hacking into the main frame. There’s no list of who can and can’t say the n-word. The first two episodes are absolutely fantastic, but they’re also absurdly in your face. It’s in a good way, but “Dr. Hell No” instead chooses to do a lot of its humor and storytelling based on what isn’t said, and it’s a nice change of pace. Dre can’t just tell his father how he feels, which is what leads to all of his outbursts and over-reactions. Then, on a micro level, the subtlety trickles down to everything that surrounds the main plot. You have Zoey and Jack’s stickers, which are never addressed but remain throughout the episode (it appears the watch sticker is still there even in the tag). You have Diane reading a book on torts and no one even thinking to question it (when they really should). You have the lack of realization from characters that Charlie and Pops had that cranberry juice with each other, not random strangers. And considering Black-ish’s purposes when it comes to depicting the black experience, it’s important to note that this is an episode with back-to-back scenes of black women doing hair for bed (Rainbow combing her hair, followed by Zoey wrapping Diane’s hair). That’s not even something that contributes to the humor of the episode; it’s something that contributes to the honesty and relatability (to a black audience) of the world that this show takes place in. On mainstream—which can mostly be read as “white” television—that’s not something you see. Black-ish may actually be at its funniest the weirder and more surreal it gets, but including notable black things without even calling attention to them is so important. Because things like that are just facts of life when it comes to the black experience. These are scenes where characters just have conversations about the plot and doing something that’s a part of every day life. When people speak about the power of diversity and seeing a face like yours on the screen, it’s moments like these which make it obvious this is real representation and not just a quota. I haven’t even gotten to the actual, intended emotional beat of the episode. 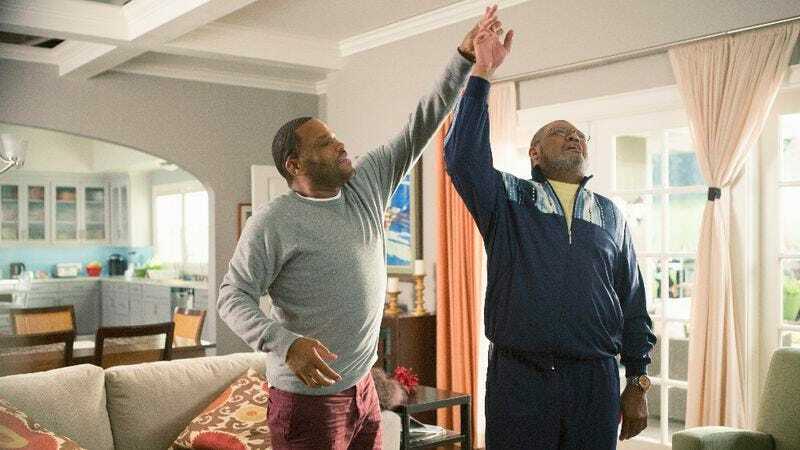 That would be the scene with Pops and Dre, set to “I’ll Be Missing You.” Black-ish speaks about a lot of important issues, but I don’t know if I would consider it an emotional show until this very moment. 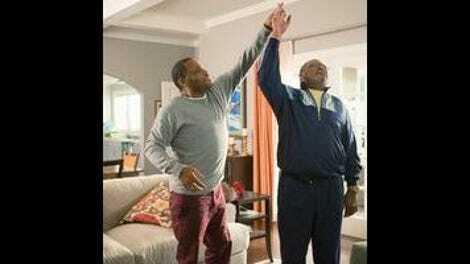 The episode has Anthony Anderson “Anthony Andersoning” up and down the place from beginning to end, and yet, just that one simple scene took me to a place where I could tear up. I cried watching Black-ish as it played Puff Daddy—that’s not a thing you expect to do or hear. It’s a well-executed scene, but a big part of why it (and Pops’ health issues) works is that, even with all I said about Fishburne being an executive producer on the show and the death of Hannibal, it made it very easy to believe that this could be the end for Pops or that Pops could at least meet his demise fairly soon. To compare it to The Carmichael Show, a show I’ve wanted to compare Black-ish to since this season started, that’s a show that does a lot of the same things as Black-ish, only in a broader, multi-camera way. In the episode “Kale,“ Jerrod’s father Joe (played by David Alan Grier) has health problems, and it also becomes a matter of a son worrying too much about his father. It’s a good episode, and that series is one of the biggest surprises of the year, but at no point is there that fear for Joe’s life that exists here for Pops’ life. For The Carmichael Show, a large part of it is the multi-camera, laugh track stigma of it all, and another large part of it is that it’s a new show, but really, Black-ish is such a confident show this early in its life (remember the first season finale?) that it’s easy to believe it would pull the trigger if it felt it best for the story. Black-ish season two has already started on such an emotional baseline between Dre and Pops that it’s absolutely easy to believe Pops might not make it out of it alive, if not now then one day down the series’ road. If that does happen, I have just the musical number for such an occasion. After such an intense season of Review, I have to say that this episode was a real waste of Andy Daly, even if he did have a good line about meeting with his malpractice lawyer. Then again, I feel all comedies need so much more Andy Daly than they already have, so make of that what you will. As the success rate of the procedure went down from 95 to 90 to 88 to 85, I found myself reminded of the Weird Loners episode bit with Stosh constantly increasing his percentage as a manager. I do appreciate a good percentage runner. Anyway, you’re welcome for the reminder of the brief (but pretty good) existence of Weird Loners. Dre: “Well, if you want to live to see Olivia have Fitz’s baby, you gonna get that surgery.” On second thought, don’t get the surgery, Pops. We’re depending on you.